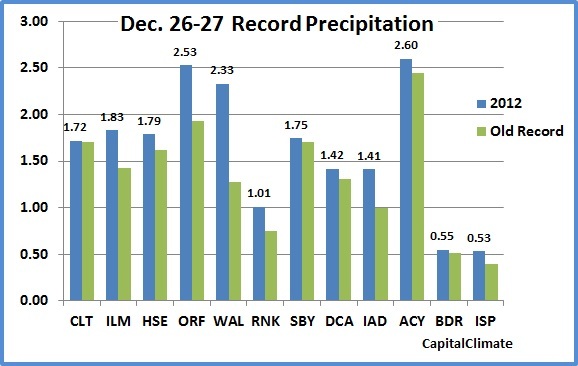 The strong storm which moved up the East Coast on December 26-27 brought record rainfall amounts from North Carolina to Connecticut. 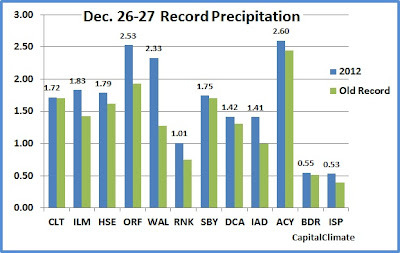 National Climatic Data Center reports show 196 daily precipitation records broken and 7 tied for a total of 203 across the U.S. on the day after Christmas. Among major National Weather Service (NWS) reporting locations, the following list shows the new daily record precipitation amounts and the previous records. (Except for Bridgeport and Islip, all of the records were set on December 26.) The oldest record broken was from 1873 at Wilmington NC. The previous records were set just 3 years ago at Cape Hatteras and Atlantic City. On average, the new records exceeded the old ones by 21%. 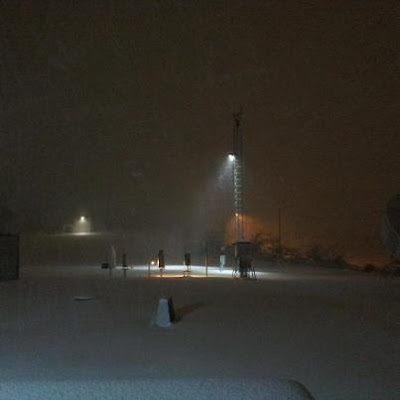 Image (click to enlarge) from National Weather Service: "Heavy snow falling at the National Weather Service here in North Little Rock. This image was taken just before 10 pm...looking north towards the rain gauges and upper air shelter (where weather balloons are released) in the background." 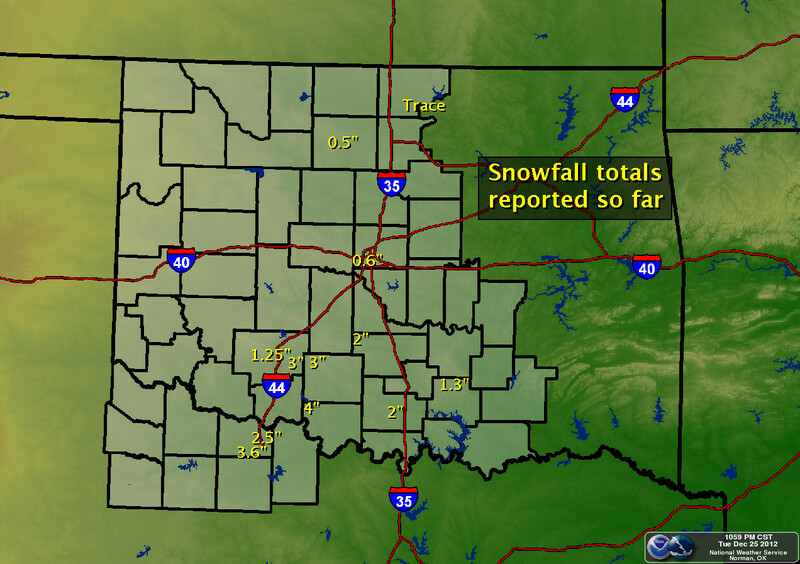 December 26, 10 AM Update: The final storm total is 10.3" at both Little Rock and North Little Rock. This is a new all-time December single storm and monthly snowfall record (see list below). The 9.0" at Adams Field is more than double the old record of 4.2" for December 25. It is also the second highest for any day in December since Little Rock snowfall records began in 1875. Through December 24, the month to date average temperature at Little Rock is 53.0°, which is 9.4° above normal. 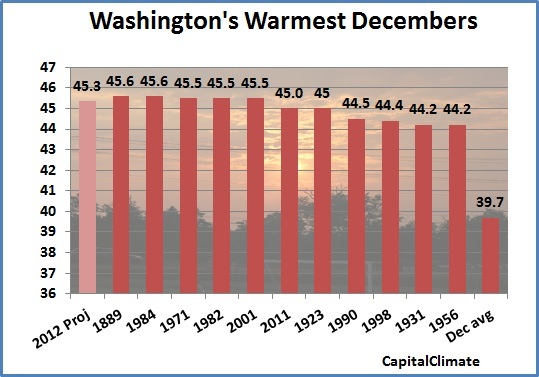 At this rate, this would be the second warmest December on record. 1. 22 DEC 1963 - 9.8" 6. 25 DEC 1926 – 4.2"
2. 31 DEC 1960 – 6.0" 7. 04 DEC 1898 – 4.0"
3. 12 DEC 1914 – 6.0" 8. 28 DEC 1876 – 4.0"
4. 19 DEC 1880 – 5.8" 9. 08 DEC 1917 – 3.5"
5. 16 DEC 1932 - 5.5" 10. 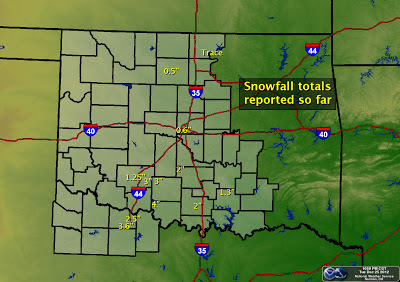 22 DEC 2004 – 3.3"
The 0.6" of snow which fell at Oklahoma City on December 25 was the second highest amount ever recorded there on Christmas. It was, however, only 10% of the 6.5" nearly a century ago in 1914. The monthly average temperature for December to date at Oklahoma City is 46.7°, which is 5.6° above normal. January 2 Update: Temperatures continued to exceed forecasts through the end of the month. The final average was 45.3°, which was 5.6° above normal. The 31st, at 1° cooler than average, was only the 3rd day all month with temperatures below average. December 29 Update: Warmer-than-forecast temperatures have pushed the projected December average to 45.2°, displacing 2011 as the 6th warmest on record (chart updated). As of today, the month-to-date average temperature for Washington DC is a toasty (for December) 47.0°. Even with forecast temperatures averaging near seasonal normals for the remaining 6 days of the month, the projected monthly average of 45.0° should be enough to tie with last year for the 6th warmest December since records began in 1870. As noted earlier, the warm December will close out a record warm year by what is virtually guaranteed to be a huge margin.